The cemetery is on the Wrawby road, a short distance from the town. The cemetery was not opened until August, 1857. It was enlarged in 1909 to about five acres. Julian P. GUFFORR has a photograph of the Cemetery Chapel on Geo-graph, taken in May, 2011. The parish was in the Brigg sub-district of the Glanford Brigg Registration District. A portion of the parish was in the Caistor sub-district of the Caistor Registration District. Many early census returns will be listed under Wrawby. You can also perform a more selective search for churches in the Brigg area or see them printed on a map. In 1699, a small chapel of ease was built here. The Anglican parish church is in the centre of town, dedicated to St. John the Evangelist. It was rebuilt in 1842-3 on the site of the earlier church (above). Some of the outside stone work was restored in 1893. The parish was constituted as an ecclessiastical parish on 13 August 1872, from parts of Bigby, Broughton, Scawby and Wrawby parishes. David WRIGHT has a photograph of St. John's Church on Geo-graph, taken in January, 2006. The Anglican parish church register of baptisms and marriages dates from 1843 and burials from 1857. See Wrawby parish for earlier entries. The Family History Library in Salt Lake City has baptisms for 1843 - 1916 on microfilm #1450442. 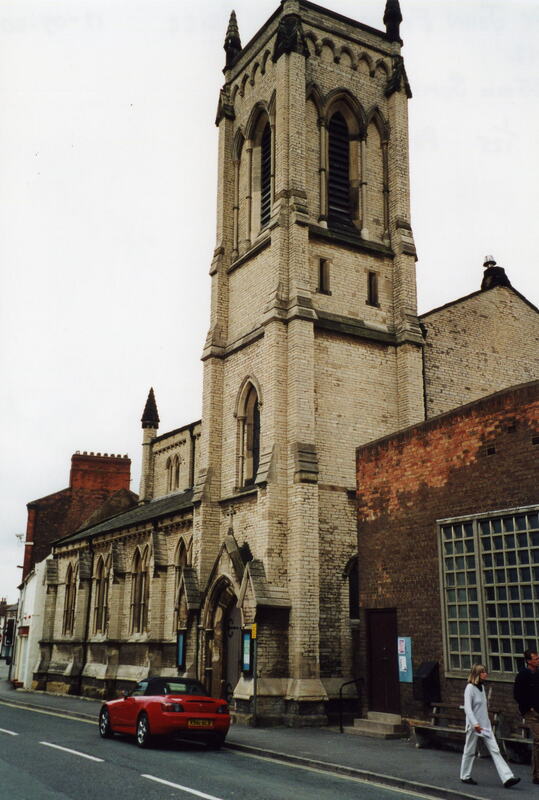 There was a Catholic Church on Bigby Street, dedicated to St. Mary, built in 1815 and seating about 120. The Congregationists had a chapel on Wrawby Street, founded in 1718. There was also a chapel for Wesleyans, one for Primitive Methodists and another for United methodists. For more information on records available for these chapels, please see our Nonconformist Chapels page. David WRIGHT has a photograph of the recently built Methodist Church on Geo-graph, taken in September, 2006. 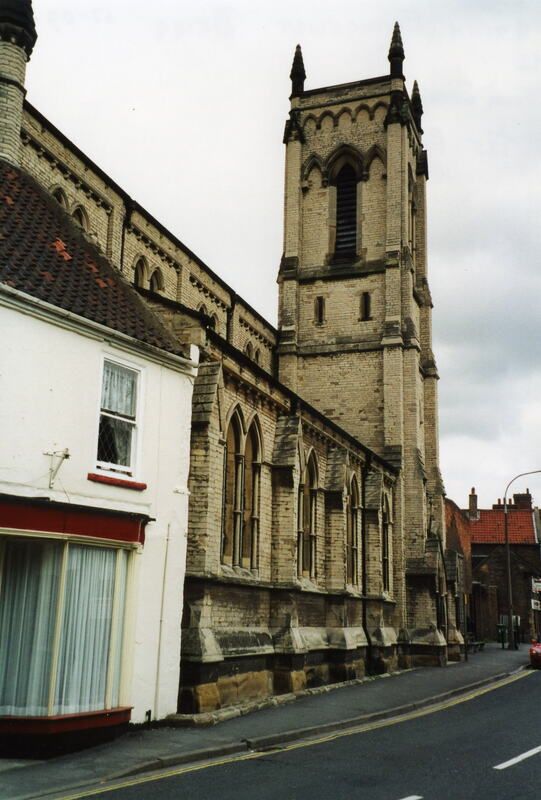 Brigg (Glanford Brigg) is a large village, market town and a parish 163 miles north of London, also 16 miles southwest of Hull and 24 miles north of Lincoln. Wrawby parish lies to the north and Broughton parish to the west. The area is flat, drained by many small canals. The parish covers only 462 acres. The M180 motorway and the A18 trunk roads pass through the parish. The A18 actually passes through the heart of the village, where the A1084 trunk road begins its winding way south and east out of town as it heads to Caistor. See the version supplied by William WALLWORTH: Kelly's 1828 Directory. Ask for a calculation of the distance from Brigg to another place. You can see the administrative areas in which Brigg has been placed at times in the past. Select one to see a link to a map of that particular area. For centuries, Brigg was a small fishing hamlet. Its location caused it to be a commercial trade hub and it grew quickly in the 19th century. In the reign of King John, Adam PAYNEL founded a Hospital here, subordinate to Selby Abbey. All traces of the Hospital have disappeared. There used to be a weekly Market Day on Thursdays in the village. The parish held a stock fair on August 5th of each year. A servant hiring fair was held each year on the Friday before old May-day. The Great Central railway had a station here in the mid-19th century. Around 1840, there were a number of packet vessels and trading vessels travelling daily or once or twice a week to Hull, Leeds, Wakefield, etc. The Corn Exchange was erected here in 1850. The Brigg Gas Works was erected in 1886. It replaced the original works built in 1836 and renovated in 1849. The Brigg Water Works was established in 1852, taking as its source St. Helen's spring in Wrawby parish. A rare book on local history is, "A history of 19th Century Brigg," by Frank HENTHORN; former history master of Brigg Grammar School. David WRIGHT has a photograph of The White Horse Inn on Geo-graph, taken in November, 2005. In 1912, Company G of the 5th Battalion Lincolnshire Regiment was stationed here. Captain H. L. ROBINSON, commanding; Color-Sergt. John ATTON, drill instructer. David WRIGHT has a photograph of the War Memorial on Geo-graph, taken in November, 2005. Paul HARROP also has a photograph of the War Memorial on Geo-graph, taken in October, 2009. Michael PECK provides us with: "Brigg (St John) Roll of Honour has now been recorded. Names, ranks and arms of service mentioned are:"
Brigg branch of the British Legion. Lest we forget. Page 3 - They shall not grow old as we that are left grow old. Age shall not weary them nor the years condemn. At the going down of the sun and in the morning we will remember them. The name is often rendered as Glamford Briggs, Glanford Brigg, Glandford Brigg or even Glanford Bridge. Mike EDWARDS reports the name as 1787, Glamford Briggs, 1807. Glanford Bridge, 1845, Glandford Bridge, 1866, Glamford Briggs, 1895, Brigg, and 1904, Brigg. The "Lincolnshire Star" on Bigby Street was published here from 1906 until 1927, weekly, on Fridays. For more on newspapers, see our Newspapers webpage. In 1864, Brigg was recognized as a separate urban district by local authorities. The parish was in the ancient Yarborough Wapentake in the Glanford district in the parts of Lindsey. The Urban District of Glanford Brigg covers a larger area than the parish. Parts of several neighboring parishes are included. About 1664, William THOROLD left a yearly rent-charge of 40 shillings for the apprenticing of a poor boy. After the Poor Law Amendment Act of 1834, this parish became part of the Glanford Brigg Poor Law Union. Population figures may include parts of Brigg urban district in other parishes. In 1841, for example, the town's population was given as 2,300. And in 1872, as over 3,165. A Free School was founded here by Sir John NELTHORPE, baronet, in 1669. This became the Brigg Grammar School which was built in 1674 and enlarged in 1878 on what was latter called Grammer School road. The buildings were enlarged again in 1912. The Brigg Grammar School was still in operation in the 1940's. Brigg National School was built on Albert Street in 1855 with room for about 200 boys. Another Brigg National School was built on Bigby Road in 1855 with room for about 183 girls. It has been reported that this school closed around 1930. An Infants School was established on Coney Court in 1848 with room for about 180 children. The building was originally an old warehouse and was converted for use as a school. It was part of the National School system when opened. A Catholic School was built on Bigby Street (year unknown, but prior to 1900) and held about 80 students.